Many car rental companies on Maui say you can’t drive around the south side of Mt. Haleakala. Don’t believe them. There is a 10 mile stretch of well graded gravel road along the way but, unless the weather is extremely bad, any vehicle can safely travel this road. What the car companies really mean is that, if you get into trouble, they won’t come rescue you. Furthermore, since there is little or no cell phone coverage on this side of the island, if you do get into trouble, you’ll have to rely on the kindness of strangers for whatever help you might need. So there is some risk – but there’s some risk at the beach too. A little west of the Kipahulu part of Haleakala National Park, the Hana Highway becomes Highway 31. 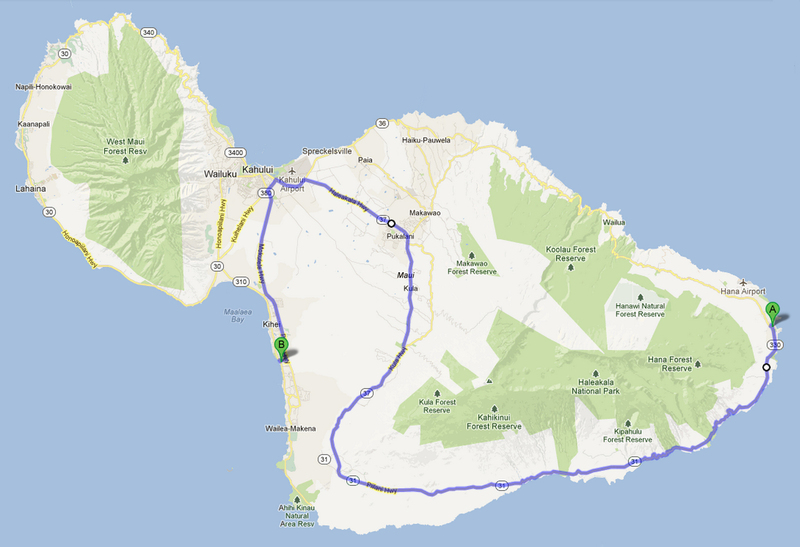 As you travel west and turn north toward the Maui Winery at Ulupalakua it becomes Highway 37, the Kula Highway. It’s an alternate way to get to or from Hana. Highway 31 is much different from the lush jungle-like Hana Highway. The waterfalls and hairpin corners are replaced by sweeping views of the mountain, ocean and, in the distance, Mauna Loa and Mauna Kea on the Big Island. It’s a much easier on the driver and provides an experience of Maui not everyone gets to enjoy. Consider it on your next trip to Hana. For other posts on Hana and east Maui, see Hana – Oheo Gulch and the Pipiwai Trail and The Hana Highway. The road to Hana offers many spectacular views but much more awaits those who venture from the beaten path. If you’re going to make one long stop, consider the Pipiwai trail. The trail is a four mile round trip up the Oheo Gulch through bamboo forests past spectacular waterfalls and pools.Vertical gain to Waimoku Falls, the turn around point, is 650 feet. Allow 2+ hours – more if you like to savor the sights at a leisurely pace. Sometimes called The Seven Sacred Pools, the lower pools on the Oheo Gulch are a VERY popular destination about 12 miles past Hana. But there’s a lot more than seven pools and there’s nothing particularly sacred about them. The name, “Seven Sacred Pools,” is just a marketing ploy someone dreamed up a long time ago. The well marked trail head is near the visitor center in the Kipahulu area of Haleakala National Park. A three day park pass – which is also good for the summit – is $10. Wear good shoes and carry water. Note: the river is prone to flash flooding. Don’t go if it’s raining or threatening to rain. For the drive to Hana, see our post The Hana Highway. For driving the an alternate route to or from Hana (i.e. the south coast of Maui) see Hana – the Road Less Traveled.